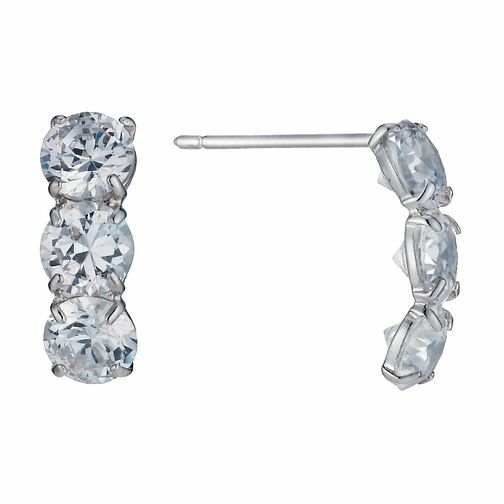 Complete your bridal look with these elegant trilogy wedding earrings, perfect for that classic dash of sparkle. A row of three glittering Cubic Zirconia are claw set in precious 9ct white gold, creating a simple yet luxurious look perfect for a wedding. 9ct White Gold Trilogy Cubic Ziconia Wedding Earrings is rated 1.3 out of 5 by 4. Rated 2 out of 5 by Anonymous from disappointmented I purchased these earrings for my wedding. Although they looked lovely and sparkly with my dress, similar to the other reviews the back on one was loose, and one was lost in less than 24hrs . Very disappointed and upset, especially as I paid full price for these.